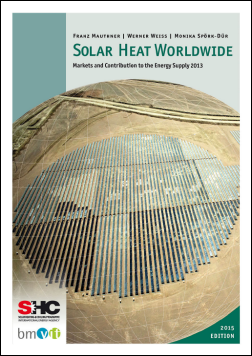 IEA SHC || News || IEA SHC Solar Heat Worldwide - 2015 Edition! This report comprises solar thermal market data from 60 countries covering an estimated 95% of the worldwide market. The remaining 5%of the market were extrapolated and are labeled as “all other countries” in the following sections. By the end of 2013, an installed capacity of 374.7 GWth, corresponding to a total of 535 million square meters of collector area was in operation worldwide. The vast majority of the total capacity in operation was installed in China (262.3 GWth) and Europe (44.1 GWth), which together accounted for 82% of the total capacity installed. The remaining installed capacity was shared between the United States and Canada (17.7 GWth), Asia excluding China (10.0 GWth), Latin America (8.7 GWth), the MENA2 countries Israel, Jordan, Lebanon, Morocco, the Palestinian Territories and Tunisia (6.1 GWth), Australia and New Zealand (5.9 GWth), and Sub-Sahara African countries Mauritius, Mozambique, Namibia, South Africa and Zimbabwe (1.2 GWth). Themarket volume of “all other countries” is estimated to amount for 5%of the total installations (18.7 GWth). The breakdown of the cumulated capacity in operation in 2013 by collector type is 22.4% glazed flat-plate collectors, 70.5% evacuated tube collectors, 6.7% unglazed water collectors, and 0.4% glazed and unglazed air collectors. The leading countries in cumulated unglazed and glazed water collector capacity in operation in 2013 per 1,000 inhabitants were Austria (430 kWth/1,000 inhabitants), Cyprus (425 kWth/1,000 inhabitants), Israel (377 kWth/1,000 inhabitants), Barbados (319 kWth/1,000 inhabitants), Greece (271 kWth/1,000 inhabitants), the Palestinian Territories (257 kWth/1,000 inhabitants), Australia (252 kWth/1,000 inhabitants), China (194 kWth/1,000 inhabitants), Germany (151 kWth/1,000 inhabitants) and Turkey (136 kWth/1,000 inhabitants). Download the full report at www.iea-shc.org/solar-heat-worldwide.